Richard Williams is a triple Oscar winner. He has won over 250 international awards including 3 British Academy Awards, 3 Oscars and an Emmy. His films include Who Framed Roger Rabbit, The Return of the Pink Panther, The Charge of the Light Brigade, A Christmas Carol and The Little Island. People he has worked with include Ken Harris, Art Babbitt, Milt Kahl, Grim Natwick, Frank Thomas, Ollie Johnston, Andreas Deja, Eric Goldberg, Simon Wells, Emery Hawkins, Cliff Nordberg, Abe Levitow, and Chuck Jones. At a young age Richard Williams moved to from his native Canada to Spain to paint and study. In 1955 he had an idea for an animated film. England was the nearest English-speaking country and he figured if he was going to animate he had better move there. He spent the next three years making that film (The Little Island). This short won him instant recognition as a major talent. Other films followed such as "Love Me Love ME" and the Academy Award winning "A Christmas Carol" along with his commercials and animated segments for feature films that cemented his reputation for creating high quality inventive animation. A turning point for him came when he and his staff went to see The Jungle Book in 1968. They had been taking character animation for granted and were blown away by what they saw. He was most impressed with the animation of Shere Khan done by Milt Kahl. He promptly wrote Milt and invited him to visit the studio. This was the beginning of their long friendship and the start of his effort to seek out some of the "Old Timers" to learn from and even employ. Art Babbit came to his studio to work and to teach his now legendary animation classes to the staff. Working on the Thief and The Cobbler (It went by many names over the years) was partly a learning exercise for him and his staff. It's footage also landed them the Roger Rabbit gig. Williams made one other feature before Roger Rabbit; "Raggedy Ann and Andy". He was original hired as supervisor and Abe Levitow was to direct. When Abe got sick, Williams was contractually obligated to take over directing. He made the best of the material he was given, but they wouldn't let him drop any of the 20 songs in the film. He was going over time and budget so the film was finished hastily for him by 20th Century fox. An Omen of things to come. Williams most well know film is Who Framed Roger Rabbit where he served as animation director. This film is widely considered to be the film that started the second golden age of animation. Richard Williams is currently living in Canada and is working on a new film on his own. After his past experiences he is not giving out any information on what it is about. He has also recently been passing his expertise to new talent via his Animation Masterclass and his new book The Animator's Survival Kit. 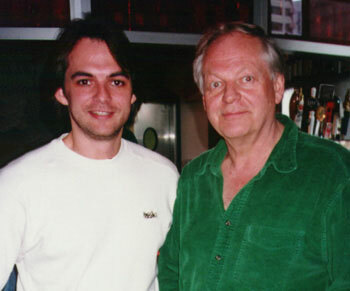 The picture above is Richard Williams and Me.